I don’t know if you’re like me but even when I’m not feeling 100% myself, I still feel like I want to make something. 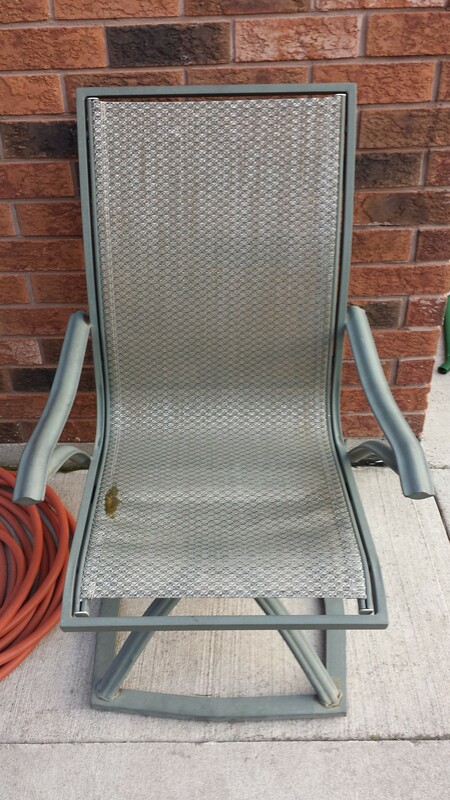 Picked up a pair of these patio chairs back in the fall. Mr. Restyle thought they’d be easy to redo. I wasn’t so convinced but decided to tackle them this weekend anyway. Here’s the before. 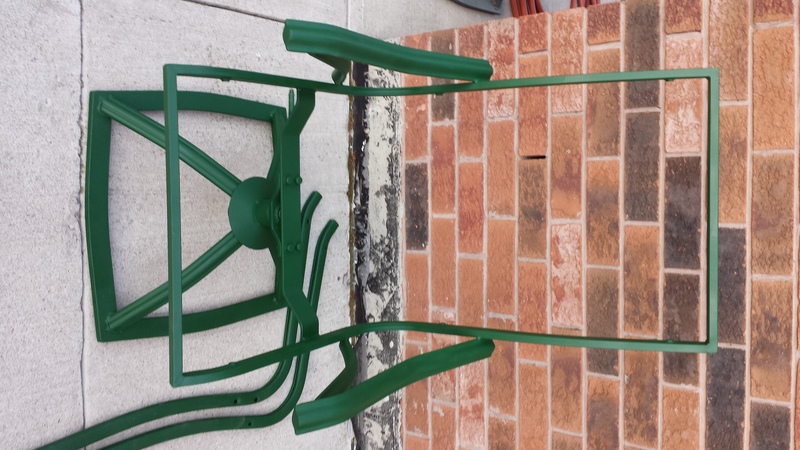 Lovely daughter took on the task of spray painting these worn out, faded chairs. 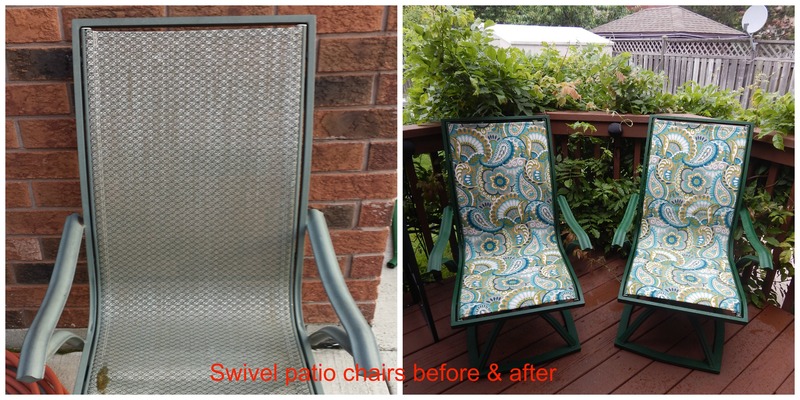 Since I love green and we have an existing green patio set, we decided to stick with that colour. 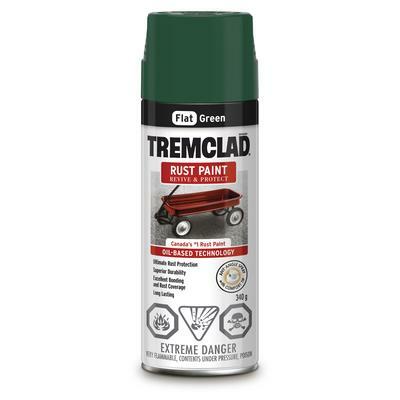 Husband and daughter headed out to the store and picked up some Tremclad rust paint in Flat Green. 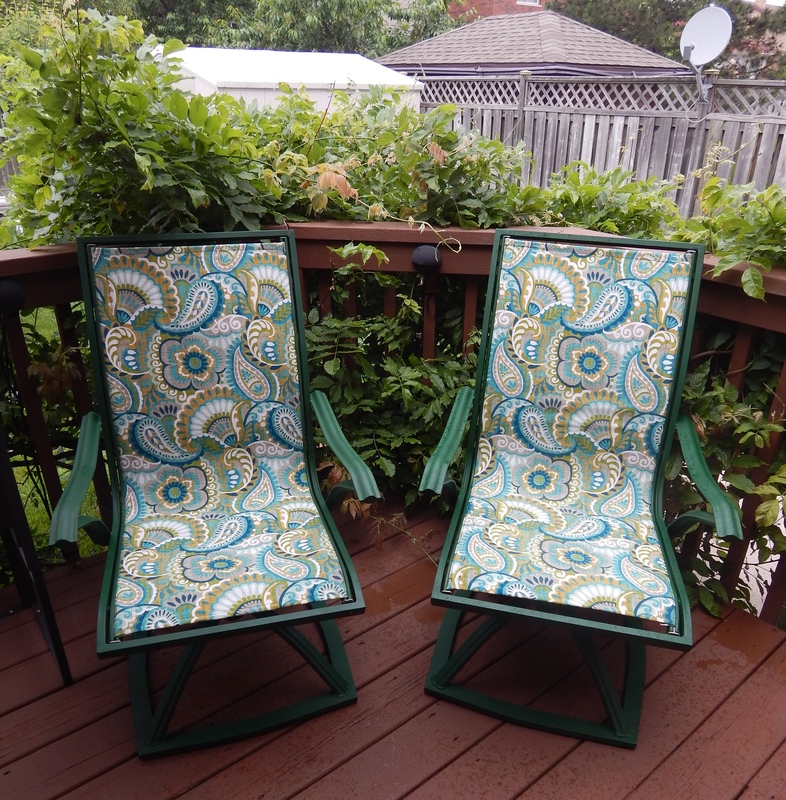 The fabric on the chairs is that tough meshy lawn chair fabric. I don’t even know what it’s called but we couldn’t find replacement fabric anywhere. Probably a special order type deal, which was not in the plan so we opted for outdoor fabric to cover the front. The back I just spray painted the same green. The chairs have really heavy duty wire-like piping along the edges which slides into the grooves of the chair to hold it in place. 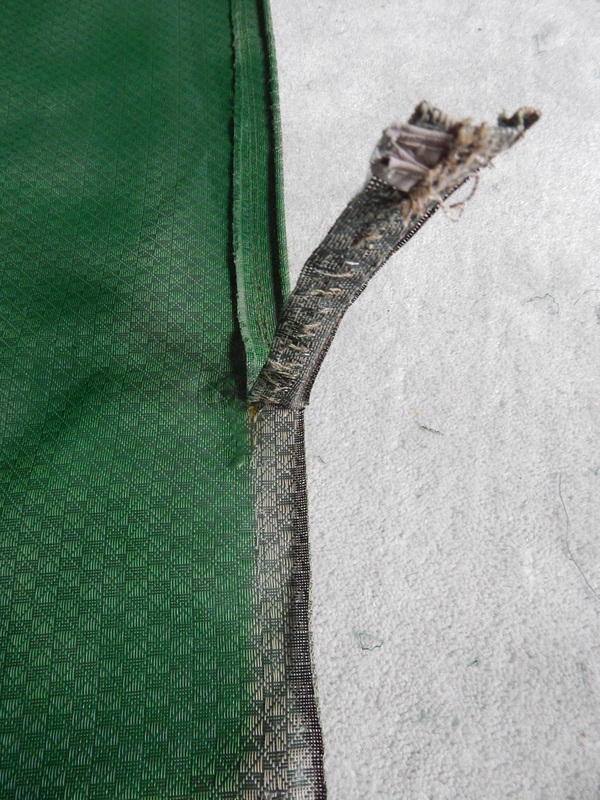 My plan was to remove the wire piping, cut over the original piping enclosure and create a new one from the new fabric. Sounds easy right? Wrong! Not so easy to do. Bulky, sewing machine tension problems, etc. 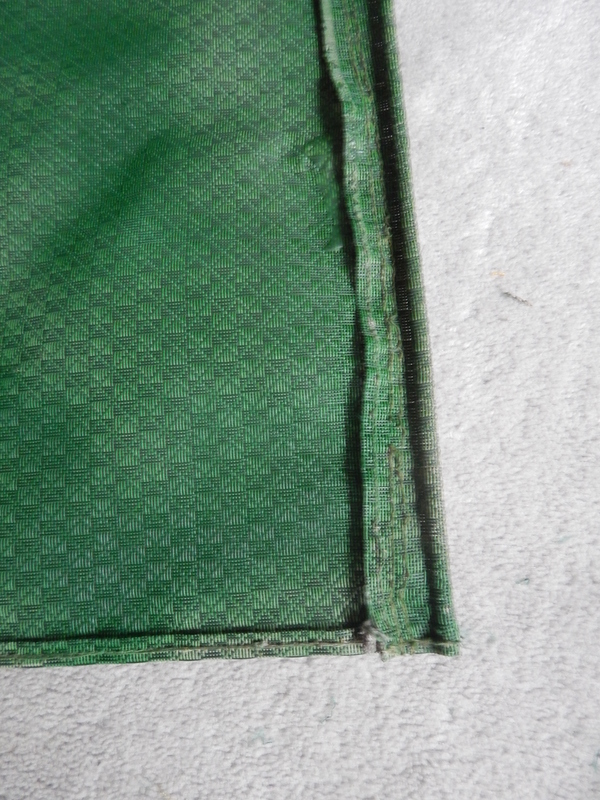 so onto Plan B. Incidentally, you need to use thread made especially for outdoor fabrics and man, is it ever durable. I found out just how durable when I had to remove the entire casing that I created on both sides for 2 chairs when Plan A failed. I decided the easiest way to deal with all of this was just to cut off the bulky edges and I’d figure it out as I went along. As I stripped away the edge, I had another problem-the edges weren’t painted and I had no more paint. Now this wouldn’t have been a problem but I had already folded over the edges of my outdoor fabric and sewed them in place. I was worried I wouldn’t be able to cover the unpainted edge. I decided to chance it. I ended up cutting away a bit more than is seen in the picture above to reduce the bulk further, making sure that the finished width would be the same as the original chair. This part worried me because I am completely awful at measuring in inches and I’ve been known to measure twice, cut once and still end up with miscalculated, too small or too big pieces when I sew. How the heck does that happen? Anyway, after some trial and error. This is how they turned out. 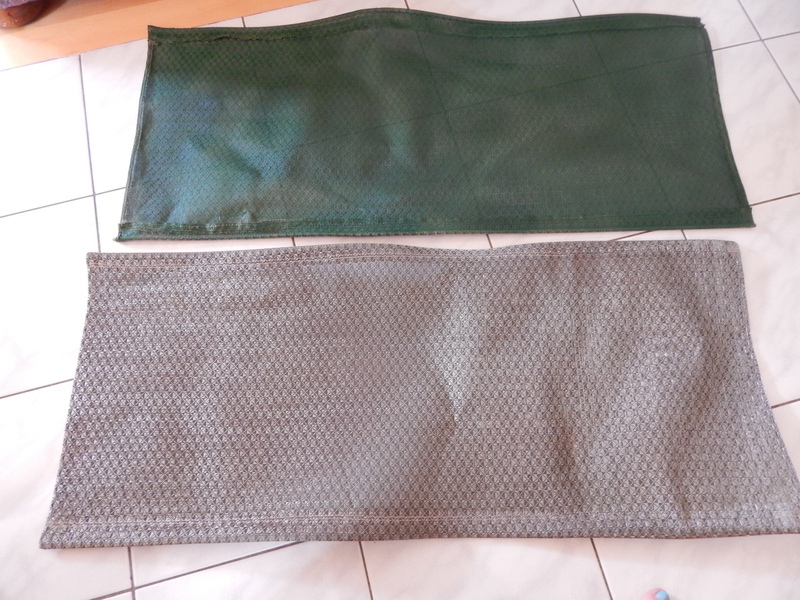 The outdoor fabric holds the piping along the edges, the original mesh was placed on the back, the fabric edges were folded over and sewn right onto the mesh. I wanted to do a tutorial but was battling a queasy tummy all weekend, so sorry about that. Had I been at the fabric store by myself I would’ve chosen something a little louder to play with the bright green but I really like how they turned out. And here’s dear daughter who I coaxed into posing.